We fabricate wide assortment of Hockey sports wears that are in sync with set standards of the industry. Our sports wears are famous among sports person due to their comfortable fabric and unmatched quality. Available in customized dimensions, our sportswear provide the wearers unrestrained free movement. This T-shirt is in Sublimation printing used very fine quality fabric . 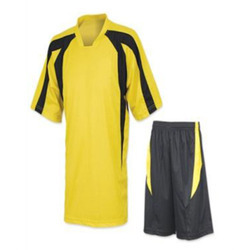 We have emerged as one of the most prominent manufacturer and supplier of Plain Sports T-Shirts. Our product is highly appreciated for its fabric quality, striking looks and on top of that is the comfort. Our product is also tested on certain parameters for its intact stitch, quality, shrink resistance and colorfastness. Color: White, Green, Black, Red etc. Our range of PQ Polo T-Shirts are appropriate for round the season wear and is available in lively color combination and startling designs. We make sure that the collection of Unisex Polo Shirt is crafted to offer a relaxed fit. Offering an exclusive range of printed stripe polo shirts. 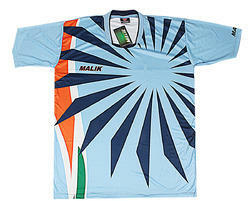 Available with us is a wide array of Cricket T Shirts to the clients. Our products are manufactured in compliance with the industrial norms as well as exact requirements of the esteemed patrons. These products are manufactured using the optimum quality raw material, which makes these products highly effective. We are a remarkable entity, engaged in manufacturing a qualitative array of Men's Round Neck Sports T-Shirts. Jay Kay Hosiery Mills Pvt. Ltd.
We hold specialization in the domain, engaged in offering a wide array of Men's Short-Sleeve Sportswear T-Shirts. These Men's Short-Sleeve Sportswear T-Shirts are widely demanded by the clients for their beautiful designs and flawless patterns. Our products are known for their washable and known for their fade resistant nature.